The Conway Municipal Airport at Cantrell Field, situated on a 431-acre site in southwest Conway, located 10 miles southwest of Conway’s city center, opened in September 2014. The airport is served by Runway 4-22, a 5,500' x 100' concrete runway and full-length parallel taxiway. State of the art LEDs provide all airfield lighting, and GPS WAAS/LPV approaches serve the airport to both runways. The City of Conway operates the Fixed Based Operation as a branded Phillips 66 dealer. 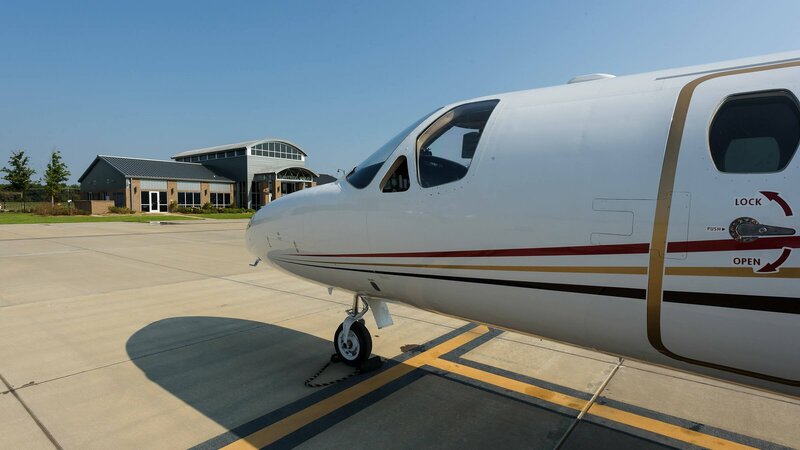 Both Jet A and 100LL are offered full service, and self-serve 100LL is available 24/7. Cantrell Field staff can provide for all of your fuel, ground service, hangar (please call to check availability), and transportation needs. Whether you are visiting Conway for a few minutes or a few days, call us or stop by and let us show you how our beautiful facility and exemplary customer service can make your stay even more pleasant. Several corporate flight departments are based at the airport, located on their own corporate apron area on the north end of the airfield. Smaller planes are housed in a 46 aircraft T-hangar complex on the south end of the airfield. Transient traffic is served on the terminal ramp in the center of the airfield. There you will find the 6,300 square ft state of the art terminal and community hangar. The terminal includes a classroom for flight training activities, a conference room, and a 24-hour accessible pilot’s lounge with bathrooms, shower, snooze room, vending machines, weather computers, and Wi-Fi throughout. The self-serve 100LL pump and credit card terminal is located on the northwest corner of the terminal ramp. The airport is located 10.3 miles west of Interstate 40, along U.S. Highway 60 (Dave Ward Drive) to Cantrell Field Drive in the City of Conway. From I-40, Little Rock is 35 miles to the east and Fort Smith is 128 miles to the west.